Are the golf gods Real? People ask me if the golf gods are real. I always answer honestly. They are real if you believe they are real. The power of positive thinking created a billion-dollar industry with self-help books. 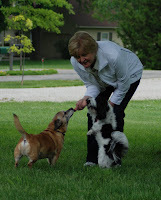 Millions of people have improved their lives dramatically by simply thinking positively. 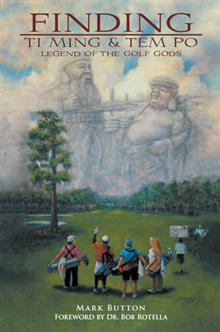 Is my new children’s book, “Finding Ti Ming and Tem Po, Legend of the golf gods,” a self-help book? ﻿﻿﻿﻿Absolutely it is. 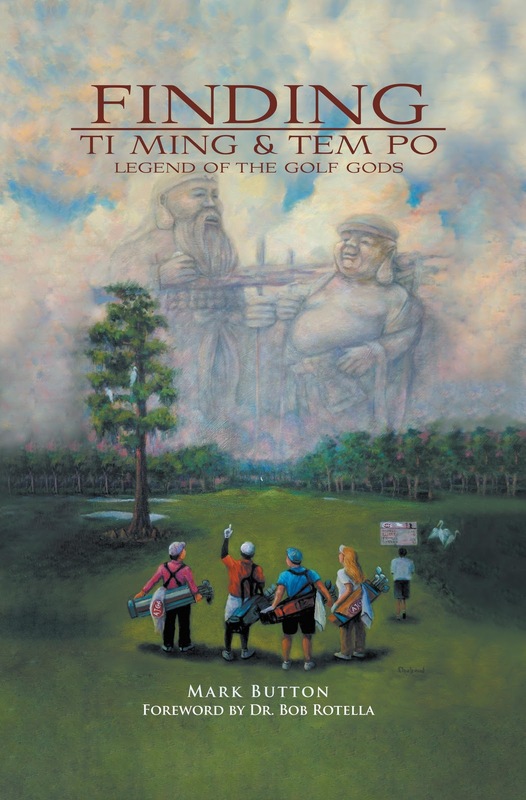 The story of Ti Ming and Tem Po helping golfers of all ages master, respect and appreciate the game of golf also teems with real-life lessons. Tem Po, the mystical caddie, tells his students, “You can’t go for every green.” The non-golf lesson is pretty clear: Sometimes the conservative approach to one of life’s challenges is the best option. Ti Ming, the all-knowing golf god, reminds his believers that the Champion Golfer is honest at all times and is respectful of his opponents. Another obvious lesson. There are several similar metaphors lying just beneath the magical and inspirational story. The book was written for kids aged 8-17, but the messages within the story transcend age. 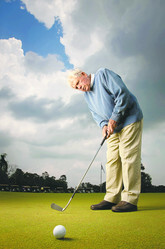 The lessons golf teaches us are salient reminders of how to conduct ourselves as respectful, honorable people. Now, back to the question. Do the golf gods exist? ﻿﻿The answer is up to you. As Henry Ford once said, “Whether you think you can do something or you think you can’t, you are right.” Belief and trust in the golf gods are the same. For the past seven-plus years, I’ve worn a Trion:Z magnetic bracelet on my right wrist. The product claims to boost blood circulation, which increases the flow of oxygen and nutrients. ﻿﻿It’s like the golf gods. If you think magnetic therapy benefits you, then it does. It could be a placebo, but I can truthfully tell you this: When I was introduced to the technology, I was feeling little twinges of a pain in both of my wrists. I called these annoying twinges a pre-symptom to a possible case of carpel tunnel syndrome. Since the day I first put on the Trion:Z bracelet, I’ve never felt those twinges of pain again. So you tell me if the product works. ﻿﻿How many times have you horribly bladed an 8-iron only to have your ball roll up the fairway, onto the green and stop inside 20 feet of the pin? I know that happens to you because it happens to me. So was the result of the bad swing just dumb luck? Or were the golf gods at play? Home with family for Thanksgiving this year—one of the many, many things for which I’m thankful—I played golf with a high school buddy on Wednesday. I swung the club pretty poorly overall but still shot an 80, which is a good score for me. ﻿﻿There were several moments during the round in which Ti Ming and Tem Po helped my cause. I bladed a wedge from the rough on the first hole, but my ball chased up to the back fringe. I shanked a 5-iron off a tree on the sixth hole … my ball bounced to the middle of the fairway. I pulled my drive on No. 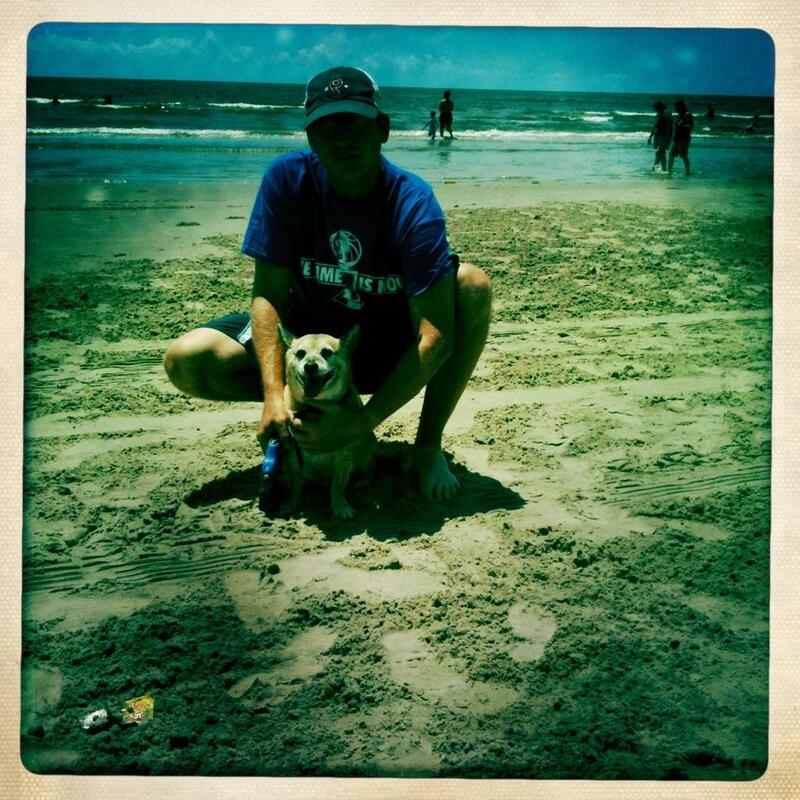 8 into the trees and out of bounds … but my ball kicked back in play. I made par to swing all the bets. On No. 12, I chunked a lob wedge that traveled about two feet. Then chipped in for par on the next shot. You can call all of that blind luck. You can call it whatever you want. That’s your choice. I choose to believe in the golf gods. I believe they helped me shoot a winning score. ﻿﻿This year I’m thankful for many things. My health. My family and friends. The U.S. Armed Forces -- active troops and the veterans -- who keep our country safe and freedom in tact. I’m thankful for my job. I’m thankful for the 13 years I spent with the Jack Dog. I’m also thankful for the golf gods. They helped me win a bunch of bets yesterday. Are the golf gods real? You know where I stand. Learn more about the mystical golf gods at http://www.timingandtempo.com/. the youngest player to win on the LPGA Tour. TRINITY—Sixteen-year-old Alexis “Lexi” Thompson is the fastest rising star in women’s professional golf. She stands six feet tall and hits the golf ball 280 yards off the tee. In September, she became the youngest winner in LPGA Tour history when she won the Navistar LPGA Classic by five shots. No player on the planet has “Caught The Spirit” more than Lexi Thompson, winner of three gold medals as a 14-year-old at the 2009 Spirit International. 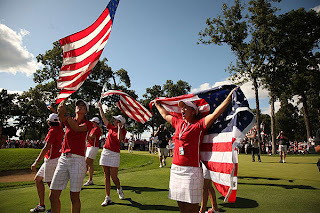 Thompson was back again this year, delivering the past champion’s speech at the opening ceremonies and playing a practice round with the U.S. Team on Tuesday. Over the next four days, 54 holes of Four Ball Stroke Play will determine gold, silver and bronze medal winners in five categories: International Team, Men’s Team, Women’s Team, Men’s Individual and Women’s Individual. Thompson made the rare clean sweep in 2009, taking the gold in the International Team, Women’s Team and Women’s Individual. Only Paula Creamer and Lorena Ochoa have accomplished the feat. Thompson said her three gold medals hang in her parents’ dining room next to the 150-plus trophies she’s amassed since winning her first U.S. Kids World Championship at age 7. The Spirit began in 2001, and in the past decade it has become known for showcasing tomorrow’s professional golf stars in the amateur setting. Major champions such as Creamer, Ochoa, Yani Tseng, Martin Kaymer and Charl Schwartzel all participated in The Spirit as amateurs. The players stay adjacent to Whispering Pines Golf Club in Camp Olympia, which transforms into the International Village during The Spirit. There’s a common dining hall where all the competitors eat, and players sleep 12 or more to a room in a true camp setting. Whispering Pines with the U.S. Team on Tuesday. In 2007, Thompson made history by becoming the youngest player to qualify for the Women’s U.S. Open. She was 12. Two years later she was dominating at Whispering Pines with 17 birdies and posting a winning 24-under par score with teammate Jennifer Johnson. 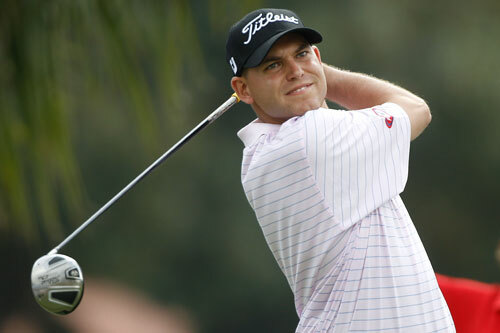 Thompson turned professional the next year as a 15-year-old. With a field comprised of 75 national champions and No. 1-ranked players from 20 countries, it is highly likely that the next Lexi Thompson or Martin Kaymer are playing at Whispering Pines this week. Thompson said she sees budding star power in the two U.S. women, LSU sophomore Austin Ernst and Arkansas sophomore Emily Tubert. exempt on the LPGA Tour for next season. Thompson planned to stay at Whispering Pines long enough to watch the U.S. Team play in the first round. The U.S. women tee off at 8:30 a.m. with the Swedish team of Daniela Holmqvist and Madelence Sagstrom, who plays at LSU with Ernst. The U.S. men follow in the 8:42 a.m. group with Swedes Robert Karlsson and Victory Tarnstorm. Former U.S. Team captain and 2011 assistant captain Alli Jarrett texted Thompson about 10 days before The Spirit to ask if she wanted to return to give the past champion’s speech. Thompson jumped at the opportunity. Like every golfer who has passed through the front gates, Thompson absolutely loves Whispering Pines. She said taking the bus ride back down Olympia Drive to the clubhouse brought back a flood of memories. NOTE: For live scoring of The Spirit, visit www.golfstat.com. The 2011 Spirit International will feature a live webcast of the competition on holes 14-18 at www.thespiritgolf.com/live-webcast.html. Follow the action on Twitter @thespiritgolf and use the official hashtag of #thespirit11. You can “like” The Spirit on Facebook at www.facebook.com/thespiritgolf. THE WOODLANDS, TEXAS—Before the world’s best amateur golfers put on a show at the most unique international team event in golf, they were treated to one on Halloween at the Cynthia Woods Pavilion. The gravity-defying performers of the acrobatic Cirque Le Masque troupe topped off the opening ceremonies for the sixth playing of The Spirit International on Monday night. The theatrical wizardry featured synchronized and costumed jugglers and aerialists performing gasp-inducing feats of balance, strength, grace and coordination. Surely the 80 amateur golfers in attendance were impressed. 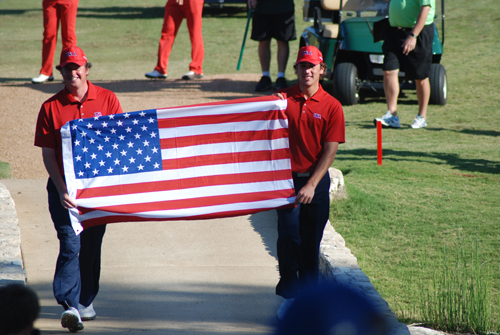 The 2011 Spirit International begins Wednesday, Nov. 2, at Whispering Pines Golf Club in Trinity, Texas. Twenty countries, represented with their top two male and female amateur golfers, will compete as teams for gold, silver and bronze medals in 54 holes of four ball stroke play. The opening ceremonies began with an address from golf media mogul and Master of Ceremonies Peter Kessler. Whispering Pines founder and Spirit Golf Association Chairman Corby Robertson presented the procession of countries with each team walking to the stage flying their nation’s flag while a video introduction of each team member played for the estimated 400 in attendance. A video address from former President George W. Bush congratulated Robertson and all the competitors for promoting international goodwill through the game of golf. Rising LPGA Tour star Alexis Thompson gave the Past Champions Address and spoke about the importance of chasing your dreams. Thompson won three gold medals at the 2009 Spirit International. That’s exactly what the players in the field at The Spirit International are doing. Seventy-five of the 80 competitors are national champions or ranked No. 1 in their home countries. 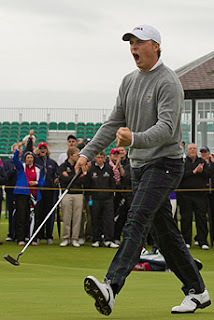 These truly are the greatest amateur golfers in the world. The bi-annual event, known as “the Olympics of golf,” has become the proving grounds for tomorrow’s golf superstars. International icons such as Lorena Ochoa, Paula Creamer, Yani Tseng, Martin Kaymer, Jason Day and Matteo Manassero are only a few past alumni of The Spirit. Smith, the oldest player in the field at 33 years, is joined by 2011 U.S. Amateur Champion Kelly Kraft from Denton, Texas. 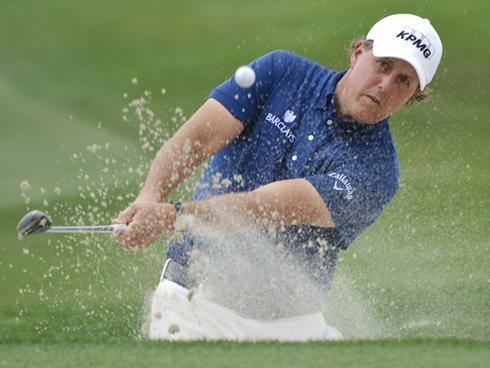 Kraft, 23, played college golf at SMU and won the Texas Amateur in 2009 and 2011. The U.S. men are accompanied by University of Arkansas sophomore Emily Tubert, 19, the 2010 U.S. Public Links Champion, and LSU sophomore Austin Ernst, 19, the reigning women’s individual NCAA Div. I champion. For fans at home or at the office, the 2011 Spirit International features a live webcast of the four-day tournament. Along with a highlight package of the opening ceremonies, the webcast is available at http://www.thespiritgolf.com/. Admission to the international competition is free.